← Bet you didn’t think my first post on my new blog was going to be this, did you? An Anniversary Story. Sort of. Yesterday was my Anniversary. This anniversary is kind of weird for me. I have now had my married name for as long as I had my maiden name. Also? This is age that I got married: 19. I have been married for 19 years. I am completely shocked that we managed to make it that long. SRSLY. "Congratulations! I've managed to stay married to you for 19 years! 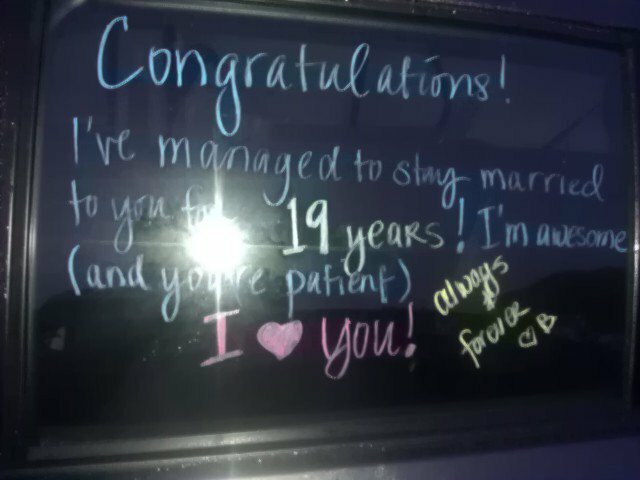 I'm awesome (and you're patient)"
I wrote this on his car window at 5AM in the dark on my way to the gym. He didn’t even know I had done this until I was LONG GONE on my way to work. Also? It’s hard to take a picture in the middle of night (or at 5AM) without a flash. And even harder to take a GOOD picture when I’m still mostly sleeping, and I haven’t had any coffee. But it’s the thought that counts, right? I really am the best kind of wife.